Intel i7, AMD R7, and nVidia 2080; these numbers, what do they mean? If you’ve ever shopped for a computer, you have no doubt encountered a barrage of numbers as you shopped different brands and models. Truly, deciphering the part numbers and comparing their relative values can be a daunting proposition. Understanding that companies tend to name and arrange parts in a hierarchy, the purpose of this article is to provide a degree of clarity to some of the most common naming schemes used by major manufacturers, so you can make the best decision for you when shopping for your next computer or gaming machine. This article will primarily refer to processors and graphics cards made by AMD and Intel. Let’s begin. Intel has maintained a fairly consistent naming scheme for the last ten or so years, since the introduction of the first-generation Core processors in 2009. It was at this time that Intel introduced the i3, i5, i7 (good, better, best) processors, which brings us to the first step in identifying Intel CPUs; determining the performance tier, or “brand modifier”, as Intel calls it. Intel usually has six different tiers, starting (weakest to strongest) Celeron, Pentium, i3, i5, i7, and now even i9. Using the diagram below, you can determine the relative ability of most modern Intel processors. Intel’s dominance over the CPU market in the second decade of the 21st century established a norm in CPU naming schemes that AMD has seemed perfectly happy to emulate. There are two categories of AMD CPUs you will generally encounter, and those are the APUs and Ryzen CPUs. APU is an acronym for accelerated processing unit, a marketing term AMD uses for its products that contain both a CPU and GPU in one chip. APUs tend to be found in value-oriented systems. The most common APUs are called A4, A6, A8, A9, A10, and A12. Like Intel’s Core-series, the number here gives you a relative idea of the processor’s strength in the lineup. 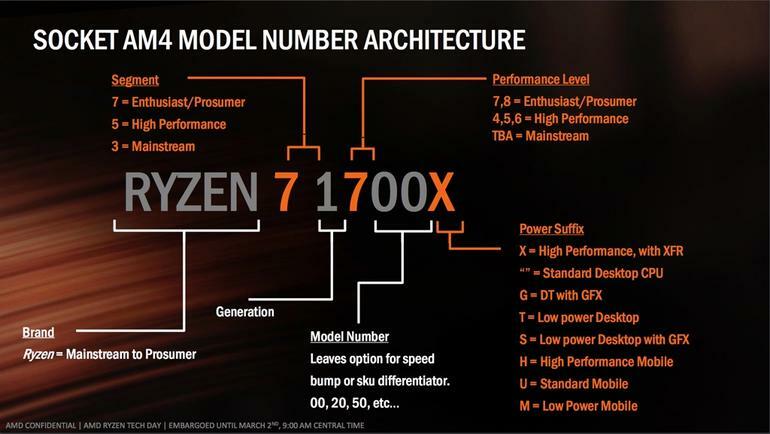 The same goes for the Ryzen lineup, which so far encompasses R3, R5, and R7 processors. 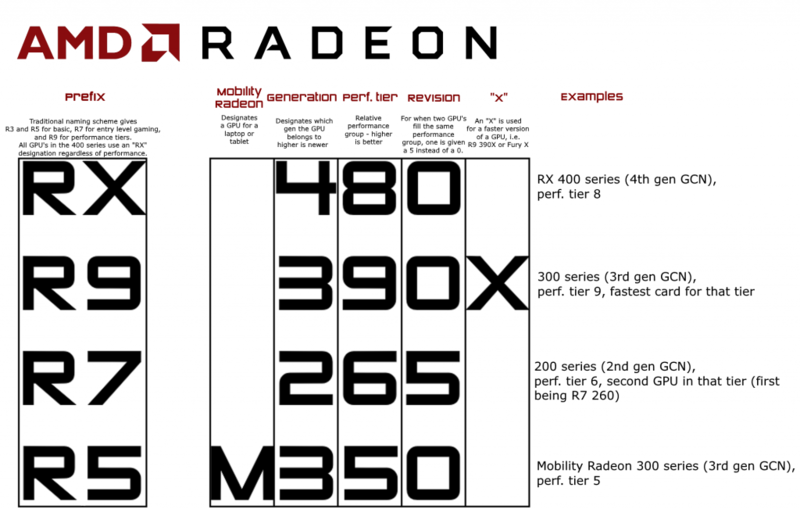 The diagram below can be used to determine the relative ability of modern AMD Processors. nVidia is a juggernaut in the world of graphics cards, so it’s important to know what you’re looking at, especially when shopping for a gaming system. 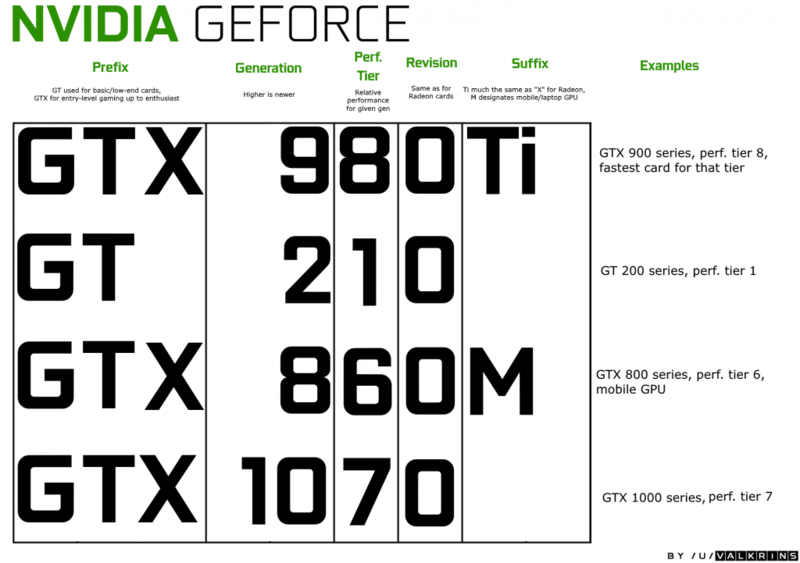 Nvidia graphics cards tend to be divided into GT, MX, GTX, RTX, and Quadro lines of GPUs. GT and MX-series GPUs tend to be found in multimedia and thin-and-light machines, primarily for the acceleration of 4K video and basic gaming. Quadro GPUs are intended for professionals and businesses that do a lot of 3D design with CAD and other visualizations. For gamers, however, the GTX and now RTX lines of GPUs are where you’ll want to focus. GTX cards have been the powerful gaming option for some time, with RTX card only recently arriving on the scene as a premium option with real-time raytracing. The below chart, created by Reddit user /u/Valkrins, will help you determine the relative ability of nVidia GPUs. Long recognized as the value-oriented choice, AMD GPUs provide excellent, competitive performance at their price points. AMD takes a different approach naming their gaming cards.Current AMD GPUs are sold under RX and Vega product lines. RX GPUs contain processors built upon AMD’s Polaris architecture, while Vega cards are so named after the Vega architecture they use. Much like nVidia’s Quadro, AMD has FirePro GPUs for the professional and scientific markets.The diagram below can be used to identify and determine the relative ability of modern AMD GPUs. This is how naming works most of the time. While these companies will always be tweaking the way they market their products, they tend to not stray too far off the beaten path when it comes to naming. Being mindful of the explanations above will help you shop for the best computer for you. 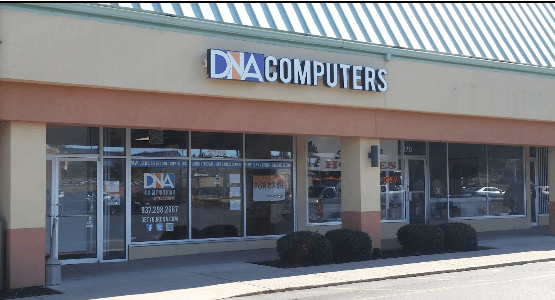 Don’t forget, if you need advice choosing components or have chosen your components and desire expert care and build quality, choose DNA Computers, your friendly neighborhood computer store.